Alcohol abuse and alcoholism represent substantial problems that affect a large portion of individuals throughout the world. Extensive research continues to be conducted in an effort to identify the biological basis of the reinforcing properties of alcohol in order to develop effective pharmacotherapeutic and behavioral interventions. One theory that has developed within the alcohol field over the past four decades postulates that the reinforcing properties of alcohol are due to the action of the metabolites/products of alcohol within the central nervous system (CNS). The most extreme version of this theory suggests that the biologically active metabolites/products of alcohol, created from the breakdown from alcohol, are the ultimate source of the reinforcing properties of alcohol. The contrary theory proposes that the reinforcing properties of alcohol are mediated completely through the interaction of the ethanol molecule with several neurochemical systems within the CNS. While there are scientific findings that offer support for both of these stances, the reinforcing properties of alcohol are most likely generated through a complex series of peripheral and central effects of both alcohol and its metabolites. Nonetheless, the development of a greater understanding for how the metabolites/products of alcohol contribute to the reinforcing properties of alcohol is an important factor in the development of efficacious pharmacotherapies for alcohol abuse and alcoholism. 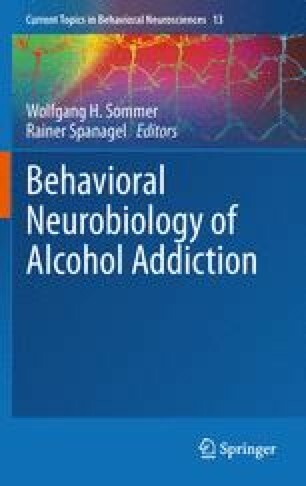 This chapter is intended to provide a historical perspective of the role of acetaldehyde (the first metabolite of alcohol) in alcohol reinforcement as well as review the basic research literature on the effects of acetaldehyde (and acetaldehyde metabolites/products) within the CNS and how these function with regard to alcohol reward.